The Absolute Best Maintenance and Service Your Fire Extinguishers Can Get. FireGuard is your complete source for Fire Extinguishers; Service, Inspections, Recharging, Hydrostatic Testing, and Training. With FireGuard, you get Factory Trained and Certified Fire Extinguisher Technicians. 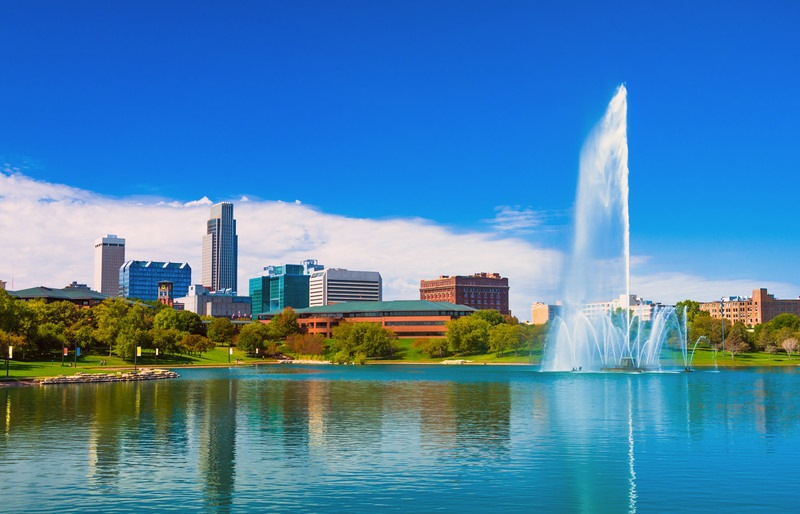 Our expert technicians know and understand the local Omaha Fire Codes to ensure your business is Fire Code compliant. To meet current Omaha Local, State, and Federal Fire Codes your fire extinguishers must be inspected by certified and trained Fire Extinguisher Technicians at a minimum of once a year. At Fireguard, we make sure your fire extinguishers are in proper working order and your business is in compliance with the local Omaha AHJ’s and fire codes. Maintenance Interval Requirements: Every Portable Fire Extinguisher per fire code shall be inspected monthly (this can be performed by one of your employees). Every Fire Extinguisher per code shall be have an Annual Maintenance and Service (performed by a certified technician – FireGuard technicians are certified!) and, Dry Chemical Fire Extinguishers that require a 12 year hydrostatic test shall have maintenance performed every 6 years. This an internal and external examination of the cylinder. One Source. One Call. That’s FireGuard. Depending on what type of portable fire extinguisher you have, a 12 year or 5 year hydrostatic test shall be performed (per fire code). 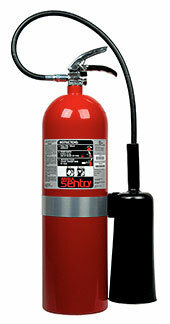 First, the fire extinguisher cylinder is inspected internally and externally. Second, the fire extinguisher cylinder is filled with water. Third, a pressure test is performed on the fire extinguisher cylinder to ensure that it does not leak or rupture. FireGuard is a DOT certified Cylinder Retesting Facility, offering FAST turn around options! Do Your Employees Know What To Do In A Fire Emergency? When was the last time your employees had fire extinguisher training? Could they handle a small fire emergency? At FireGuard we provide hands on fire extinguisher training. We start with classroom techniques: Teaching the Fire Classifications, Fire Extinguisher Types, and How to use a Portable Fire Extinguisher. Next, we have live hands-on training where each employee gets to use a portable fire extinguisher. This program will meet your OSHA requirements. Call us for more information on our Portable Fire Extinguisher Training. 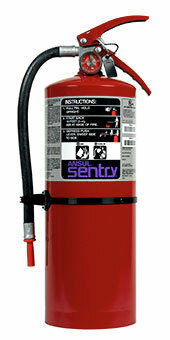 Your Source for New Fire Extinguishers. 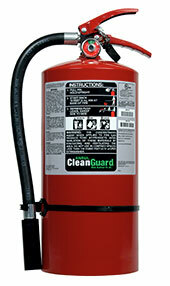 FireGuard is a full-line Ansul Fire Extinguisher distributor. Our Experts will help you choose the right fire extinguishers and fire protection equipment for your business. Call us today at 402-592-1999! 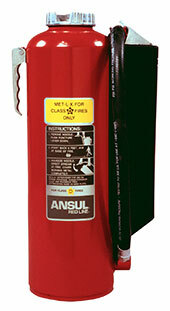 The ABC Fire Extinguisher is a Multipurpose Fire Extinguisher. Designed to put out the most common Fire Classifications: Class A, Class B, and Class C Fires. This is the fire extinguisher you need in locations like: Offices, Classrooms, Churches, Parking Garages, Hotels/Motels, Retail Stores, Auto Dealerships, Service Centers, and Manufacturer Facilities. The Standard Dry Chemical Fire Extinguisher has a sodium bicarbonate chemical base that’s perfect for Class B and C fires. This is a great solution for flammable liquid hazards in public areas like: Offices, Classrooms, Churches, Parking Garages, Auto Dealerships, and Manufacturing Facilities. The Purple K Dry Chemical Fire Extinguisher has a high performance extinguishing agent that’s great for flammable liquid fires (Class B and Class C rated). Highly recommended for flammable liquid hazards in public areas like Offices, Classrooms, Parking Garages, Auto Dealerships, Service Centers, Fuel Islands, and Manufacturing Facilities. The CO2 Fire Extinguisher contains a nonconductive clean agent that’s very effective on electronic equipment fires. Recommended in areas like: Offices, Classrooms, Churches, Hotels/Motels, and Manufacturing Facilities (Class B and Class C rated). The FE-36 Fire Extinguisher is a fire extinguisher with a clean, nonconductive gaseous agent that is a great replacement for Halon 1211 fire extinguishers. Highly recommended for protecting sensitive electronic equipment like: Computers, Telecommunications Equipment, and Robotics (Class A, Class B, and Class C rated). 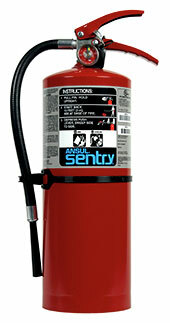 We carry a comprehensive line of Wheeled Fire Extinguishers. These units are designed to meet large extinguishing needs. 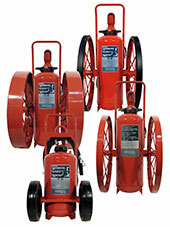 Wheeled Fire Extinguishers are available in Dry Chemical, Clean Agent, and CO2 Models.